Work in a variety of soil and groundwater conditions. Be applicable to a variety of contaminants. Be non-toxic and have no impact on soil properties. Be reasonably cost-effective, at least in comparison to existing remedies. BOS 100® and BOS 200® – Specifically, how do they work? 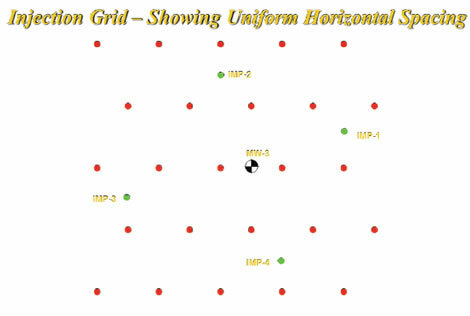 Spacing between rows and points are uniform throughout grid, but vary depending on the soil type and depth of the injection intervals. 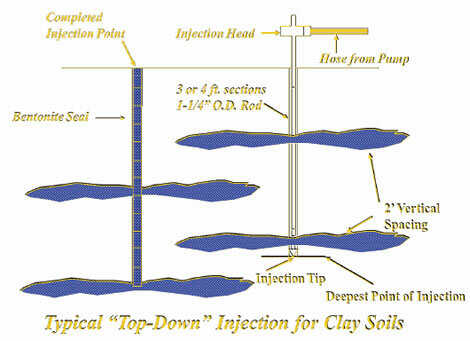 Shallow injection intervals and clayey/silty soil type require tighter injection patterns, especially with injectables such as Trap & Treat® as they are suspended solid slurries where water is being used as the carrier/delivery fluid. Spacing between points and rows for the injection patterns may vary from 5’ to 10’ centers. Reliable Industry Resources – Where you get your information matters! Established in 1995, the Interstate Technology & Regulatory Council (ITRC) is a state-led, national coalition of personnel from the environmental regulatory agencies of all 50 states and the District of Columbia, three federal agencies, tribes, and public and industry stakeholders. This organization is devoted to reducing barriers to, and speeding interstate deployment of, better, more cost-effective, innovative environmental techniques. More information about the ITRC can be found at www.itrcweb.org.